Located in Richmond Beach, this house is a part of a 150 year old waterfront community eight miles north of downtown Seattle boasting beach shacks and mansions. It's safe and ideal for the family. With the downtown Seattle area just a 20 minute drive away and the quaint seaside town of Edmonds is just 5 minutes away this is a prime location to retreat or explore. This recently remodeled 1935 house was renovated to accommodate an active, imaginative and ever growing family. Their playfulness and attention to detail makes it as much a sanctuary as it is an inspiration, leaving a lasting impression on everyone who stays here. Watch the sunset over the Olympic Mountain Range, comb the beach for treasures, relax in the hot tub over looking the water and the Railway or cozy up by the fire after a day of exploring the city. On the main floor you will find an impressive open room with tables to seat 20 people, beautiful long wood floors, a stunning stone fire place, grand piano and luxurious bench seating to compliment every inch of big window views. Attached to the main room is a large kitchen with counter tops made from a reclaimed sailboat, a viking oven and gas burners, a large fridge big enough for any family and almost everything you would need to prepare and serve food no matter what the occasion. Also on the main floor you will find three bathrooms (one with a claw foot bathtub), a laundry room, another bedroom with a queen and bunk single bed (with half bath) and every child's dream playroom equipped with books and toys galore (with a Queen pull out bed & full bath). On the Top floor you will find a large family style T.V area equipped with hundreds of DVD's. A large stone shower/bath set in a spacious master bath complements the open master bedroom with a gas fireplace. Two full work stations are available with million dollar views accompanied by a cozy reading nook to take in some peace and quiet. Climb the ladder into the extensive library, and find a small bedroom with two single beds perfect for imaginative kids and adults alike. There is one more single bedroom upstairs that completes the upper floor. If that isn't enough to wet your vacation rental appetite, you'll find a Sundance style independent apartment lit up by ground level windows facing the ocean. With a kitchen, gas fireplace, queen bed and bathroom as well as a private entrance this addition gives privacy to multiple family rentals (additional fees apply, only seasonal availability). And last but definitely not last is a quaint freshly remodeled guest house located outside of the main floor of the house. It is furnished with a pull out bed, bathroom, shower, and kitchenette and makes for a great get away for couples (additional fees apply, only seasonal availability). Whether you're having a small family gathering, business retreat, west coast getaway, or reuniting with friends, this house is dynamic enough to make anyone feel like they're at home. I am a film maker who after spending the majority of my career making major motion pictures have founded The School Of Life Project, a film initiative to increase the social and emotional development of youth all over the world. My wife is a successful clothing designer who is equally involved in the film project as she is in her own career. Julie and I are parents to 4 strange and wonderful children. Our eldest son Max and his wife, along with our daughter Madee are all pursuing careers in Seattle. Oliver and Leah who are both teenagers, keep us young and constantly learning. Family is the most important thing to us, and we hope that is evident in the structure and the feel of our home. This property screamed 'life long journey' when I first saw it. I dreamed of kids climbing that beautiful maple tree in the back, swinging on the rope swing, collecting shells on the beach, and traipsing sand over every inch of the house. I imagined being able to host our growing family for holidays, gathering friends for celebrations and never getting tired of watching the sunset after a long days work... My dreams all came true. There is nothing about this property that wasn't thought through. From its larger than life windows to let in every inch of sunrise and sunset, to the secret bedroom in the lofted library or intricate design features in every room, each portion of this house has a reason and a story behind it. Fantastic views of the Olympic Mountains. Gorgeous views of the Puget Sound. This is a special place to make forever memories with your family and friends. This was an annual girls weekend for my family, four generations including moms, aunties, sisters, daughters, nieces, sister in-laws, and cousins. We choose different locations each spring that have a little something for everyone and this is by far our favorite place. The house is eclectic and interesting, the location is perfect on the Puget Sound, the views are incredible, including sunsets and whale watching, there is the historic "Cabin Tavern" two blocks down the road, and the cute town of Edmond's to roam around. The house manger, Whitney was purrfect and very helpful during our stay. We all hope to come back again to enjoy this lovely home soon! The home is beautiful and exceeded all our expectations! The views of the ocean, the mountains, and the sunsets were breath taking! This is a very unique home and designed and decorated beautifully. We loved the fire pit, the kids LOVED the swing and the hammock, even some of the adults loved the swing. Two of our kiddos like to sleep late, so the loft was perfect for them. The beds and pillows were comfortable. The kitchen was stocked for cooking and eating in, the BBQ grill was great. The stores are very close and easy to access. The Cabin down the street was also a fun pub to visit. We had a great experience in this house. Thank you for sharing your beautiful home with us! Thanks Tara! It was fun to have you. We hope you come back again! Beautiful home with stunning views - perfect for families! Really unique and beautiful property! Perfect for families - loved both the home and the outdoor spaces. Fire pit was awesome, kids loved the swing, hammock, "secret loft" and playroom. Owners couldn't be nicer, and the home was immaculate when we arrived. Excellent place to stay, and we will definitely stay here again when visiting Seattle! Thanks Linda! You guys were the perfect guests! Looking forward to your next visit! This home was absolutely beautiful. It exceeded all of our expectations. There was so much space for our whole group. The beds and pillows were very comfortable and the decor was beautiful. The kitchen was fully stocked with everything you'd ever need to entertain. It had spices and every condiment you could need which saved us a lot of money at the grocery store. The Weber BBQ was an added treat. It is easy to get Uber to downtown, approximately 15 minutes away. Lots of stores close as well. Down the street is a nice pub with exceptional service. The hot tub, fire pit, beautiful yard and ocean front added to everything. We even saw a seal on two occasions. 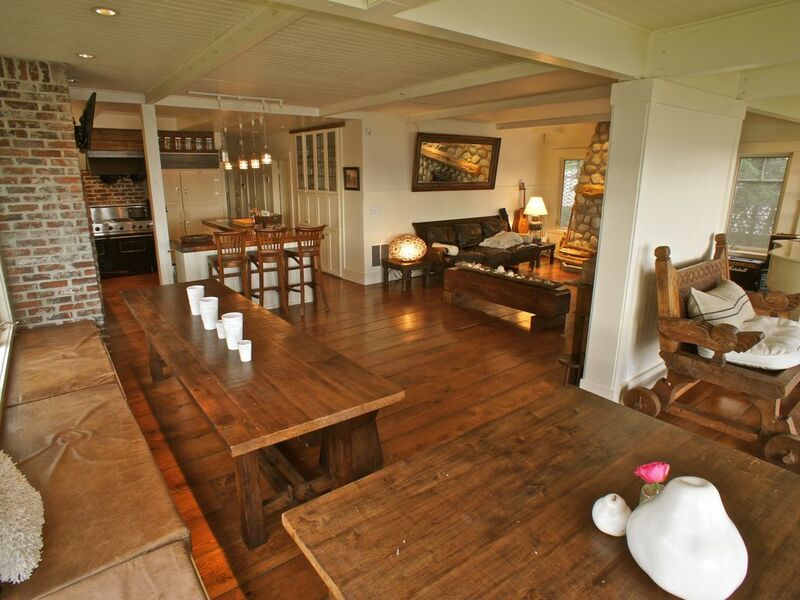 We rented this beautiful home for a very special family get together. It was my graduation from UW, or wedding reception, and the first time our families were to meet. We wanted to provide a very special vacation home to thank our families, and to share some of our milestones. We could not have imagined a more magical home! The dining area and kitchen made our foodie families jump for joy, and we thoroughly enjoyed the views of the sound while we made memories. The Stevenson family was a pleasure to work with, and we could not have imagined a more special spot. We stayed at this amazing home for 6 nights. We had a mix of friends and family for a total of 12 people on any given night. We had an infant, preschooler, high schoolers, and grandparents in the mix. We arrived late on Monday night to a well lighted and warm home. The entire house seems to have radiant floor heat which was a huge blessing to my elderly mom as she gets cold easily. There was a welcome basket from Max (caretaker) full of local goodies and brew! Max and his wife even vacated the bottom apartment to allow more sleeping space. The family with the infant used that space. The "cottage" was used by our 2 teenagers. They enjoyed having their own space. The home is amazing! Every corner holds a creative secret or interesting artifact. We could have stayed there for 2 weeks and never discovered all of it's glory. Our 3 year old grandson marveled at the train set which provided hours of entertainment. The kitchen is wonderful and fully equipped. Specifically, the gas cook top! The master bedroom mattress was the most comfortable we have ever slept in. Even when the electricity went out, we enjoyed family games by candlelight and warmth by the fireplace. Even though theweather was mostly windy and rainy (which is expected for this time of year in Washington), our teenagers still tried to brave the waters with our blow-up kayaks. This lasted about 5 minutes as the waves were pretty big and common sense prevailed. Teenagers will be teenagers. Speaking of teenagers, when the electricity was out, our teenage boys found their more primal side and started a fire in the outdoor fire pit. The sunsets were indescribable. So amazingly beautiful. Thank you Stevenson family for providing our extended family a place to be together for Thanksgiving! There is 25% cancellation fee applied to rentals cancelled over one month in advance, 50% within one month, 75% within two weeks, 0% within the week of your rental. Damage Deposits include breaking of house rules including noise curfews of 10pm on weekdays and 11pm on weekends. If this rule or other house rules are broken, your damage deposit may be kept. Please make sure you are aware of the house rules (given to you prior to arrival) before your stay! The property managers live on the property and are available for you have you any problems but will otherwise be far removed to give you your privacy. Please let us know if your rental over 8 ppl or you require the basement apartment and/or the guest house. Additional cleaning fees may apply. Specific arrangements need to be made to prepare these rooms. Thank you.